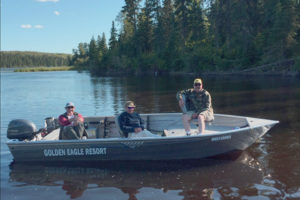 Golden Eagle Resort provides quality 18 foot deluxe boat rentals. Our fishing boat’s are deluxe versions powered by 40 HP Yamaha Motors, with on-board depth finders & pedestal seats. 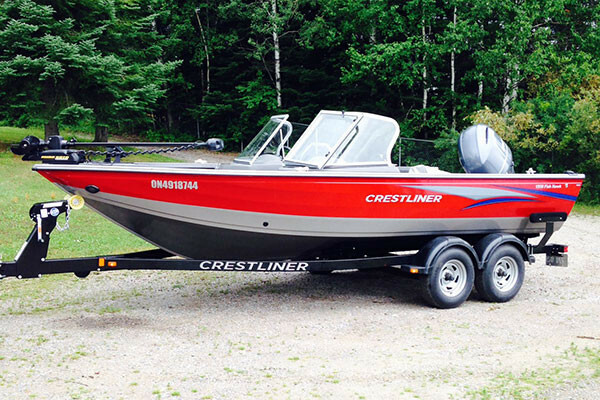 They give you a safe & stable ride out & back dependably, for a great day of fishing on Lac Seul. We offer boat launching and docking facilities, including a dockside fish cleaning house with running water. 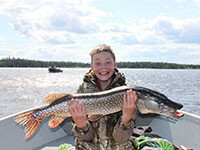 For a change of pace while on your vacation at our resort on Lac Seul, we have remote boat caches on Boville and Cramp Lakes. Special conservation fishing rules apply. We have two canoes and one paddle-boat available for guest use. 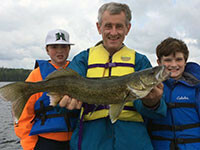 Guiding services are now available for fishing trips. We kindly ask you to book them in advance to ensure the service will be available to you while staying with us. Click here for a printable rate sheet & reservation card. 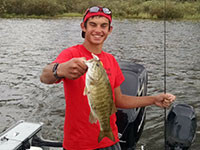 gas per week, 3 dozen minnows per boat per day, ice and freezer service. 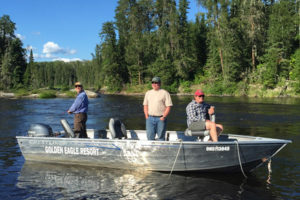 Modern cabin, own boat, 3 dozen minnows per boat per day, 13 gallons(56 litres) of gas per boat/per week, ice and freezer service, includes docking & launching on one boat. Please Note: No gas in cans may be brought into camp. Children 9 to 16 years old Half Price with 2 paying adults, 8 years and under FREE with two adults. Modern cabin, 1 deluxe 18′ boat w/40hp motor, 13 gallons(56 litres) of gasoline per week, 15 dozen minnows per week, ice and freezer service. Bring your own boat counts as package boat, camp boats are at extra cost. Modern cabin, ice and freezer service ……. $325.00 / person per week. Deluxe boats available at $325.00 / week, or $105.00 / day. Gas and bait available as needed at current rates. ** No gas in cans may be brought into camp.